Implementing commercial outdoor ashtrays help minimize the improper disposal of cigarettes and cigars. This unique ornamental round ash urn adds a decorative flair that enhances landscapes while remains a highly functional, safe outlet to dispose of smoking material. 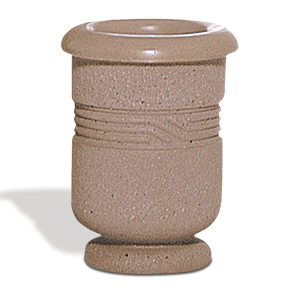 This rounded smoking receptacle features smooth, clean lines and a crafted 4-1/8" decorative cast band. The highly durable reinforced concrete ash urn has a large 15" opening providing smokers adequate space to extinguish and dispose of cigarette or cigar waste.